Since putting down my granny square project for a much-needed pause (I’ll get to those borders and assembly in due course), I’ve found myself with a bit of knitting ADD. Or possibly whiplash from having focussed on such a large project for such an amount of time…Or another metaphor which I have yet to come up with. Probably there are a lot more of those out there! Essentially I’ve been doing the knitting things, just with a bit of lack of focus. But, I have been continuing with the knitting tasks in progress, and remembering the knitting that I have been up to, and things continue and that is all good. 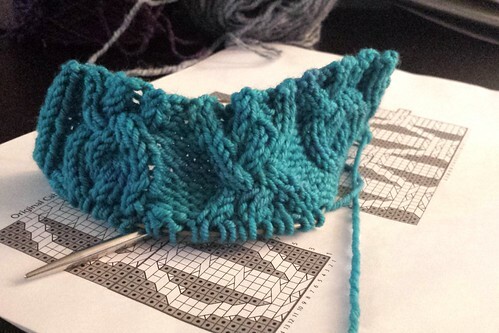 I have also done a bit of playing with cables in the last few weeks, preparing for the class I taught last weekend at the Knitter’s Frolic here in Toronto. 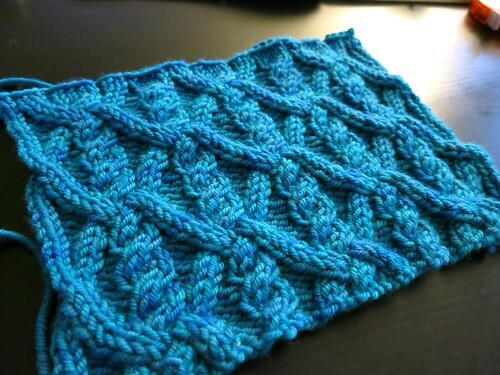 (It was all about cables and working beyond the basic stitches, and it was fun and I will definitely teach it again). The side effect, of course, is that in playing with cables even just for the exercise of it, I got thinking about other things to do with cables, and now I think I may just spend my summer knitting cables all the time. I think having a crochet-filled winter stole some of my beloved cable knitting time from me and now my brain wants that fixed! Which, really, I am totally okay with fixing that. Also, not for nothing, but you know what else I did? 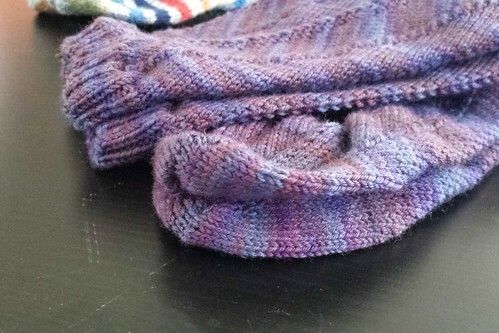 I discovered a pair of socks that I’d finished back in October except for the finishing. So I sewed up the toes and wove in the ends on those suckers. New/old pair of Jaywalkers, here we are. I hope you’re discovering some new knitting adventures this week, even if they are not so much new as old things being rediscovered – those can be new adventures too. Knitting ADD is a good description for what happens between projects for me as well! Pretty sweater! Also, instant socks are the best! 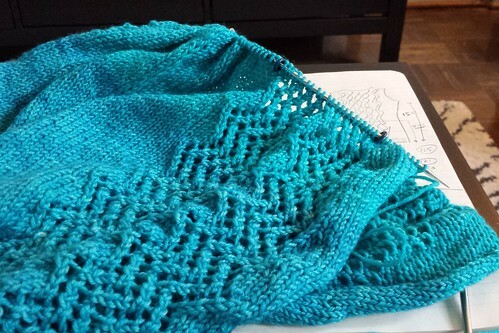 The lace panel in your turquoise sweater made me think of a waterfall I saw as a teenager: Multnomah, I think, out in Washington state. Lovely! Multnomah Falls is in Oregon. And definitely lovely — as are Bridal Veil Falls, Horsetail Falls, Fairy Falls, and all the 76 other rivulets, cascades, and thunderers along the Oregon side of the Columbia River Gorge. So sad I had to miss your class at the Frolic! Yay! That’s like finding a $20 bill in the washer! Cables are fun and these cables are beautiful!